Onstage, Bloom is a veritable veteran, performing seven sell-out shows at the Edinburgh Fringe between 1996 and 2007. Then he stopped going. ”I got married in 2008,” is his explanation. 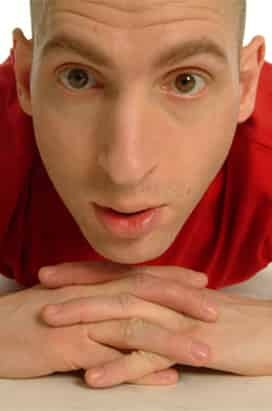 On the telly, Bloom sealed his celebrity status with appearances on hit UK shows, Mock the Week and Russell Howard’s Good News, while on the airwaves, Bloom hosted three series of his own BBC Radio 4 series, aptly titled The Problem with Adam Bloom. Behind the scenes, Bloom is an in-demand joke-writer-for-hire, penning gags for competing comedians and celebs. But as he likes to say, “Writing jokes for people is like being Julia Roberts’ leg double – you can’t give an interview and say ‘those were my legs getting out of the Ferrari in Pretty Woman’. It wouldn’t be right.